For a marketer, most social media sites are misunderstood and inherently worthless. These sites are everywhere, and if I had a dollar for every new start-up, I’d make about 15 bucks a day, according to KillerStartups.com. And I’m not the only one who can’t figure out how to use Social Networking for anything other than shameless self-promotion or indifferently posting links I forget I saw 2 days later. Even the sites themselves, such as Facebook and Digg, have scratched their heads for years now over how best to monetize their Web real estate, one ripe with an audience expecting free news, media, and friend-seekers. And if my early trials are any indication, the CTR on a Facebook Ad campaign is so incredibly poor it’s laughable. Don’t get ahead of me yet. In fact, let’s step back a moment, because Social Media is here to stay for awhile. We can connect in ways we never would’ve dreamed, and we’re only moving forward. And I really, really like to create, edit, and one-click upload stuff to YouTube or Flickr. Looking more broad & optimistically, I love the creativity and innovation on the Web. I appreciate the good ideas and how the blatantly stupid ones make me smile. Social Media has Public Relations benefit. Social sites offer a great opportunity for Public Relations and connecting with your audience. I think we could all agree on that – the public is there, the public is talking, and they may be talking about you. So get involved. But that’s also not what I’m talking about. We’re talking about marketing and making money. And, in that regard, time is very well spent doing mind-numbing on-site SEO work and optimizing my Adwords. So let’s go over the benefits of social networking for a marketer. Not Public relations, and not for the end user. Social Media sites have SEO benefit. And even if they didn’t, your presence there is enough to drive at least a little traffic, and setting up a social network shouldn’t take longer than a few hours once you know what you’re doing. Thus, as long as it’s free, it’s worth it, and I spend a lot of my time using social networks for link building activities. The number of ways you can link, re-link, cross-link and expand a “Social Network” is infinite. With some prior planning and know-how, a single e-mail can immediately roll out blog posts across 12-15 Websites. The blog feeds from those Websites post to Twitter, Facebook, and a number of the other faceless Social entities and directories with all of their cute logos, interfaces and icons. There are literally thousands of them. From there, these feeds from these sites further recycle this single email into more Tweets, posts, feeds, and so forth. E-mail campaigns steamroll through these same networks, providing backlinks and promoting stuff to anyone who indifferently took the split second to click “Follow” or “Like”. Let’s say you’ve got another blog. Why not feed in snippets of Tweets and posts from around the Internet? Maybe even your own Tweets and Posts? Tweets on tweets, for Pete’s sake. Soon, you’ve got a social hub for everything about a specific topic; it doesn’t matter if it’s flannel table cloths, homemade dog food or Babydoll Smurf T-shirts. You could probably throw this into a few endless loops and break the Internet. Not that it would serve any benefit. It probably wouldn’t. This is all free to you. I said FREE. And Google loves authoritative domains. So if you aren’t jumping on the opportunity to use Social Networking and Social Media to build new, relevant links to your website, where the hell have you been the past 3 years?!!? Many brand searches end up pulling all sorts of ridiculous crap. I worked for a company years ago that had 3-4 negative results in the top 10 when you typed in their name. Granted, for some reasons this bad press was deserved, but some of it was complete foolishness. But domains like Twitter and Facebook have some real clout in Google. And if you have an “OFFICIAL” account for each of these, you can promote them on your site/blog/etc. and with a few backlinks pump them up to the Top 10, and in the process, push the crap to the second page where maybe 10% of searchers are going to see them. This is some of your most important real estate in Google – so use it to your advantage and grab as many of those Top 10 positions as you can. The more links and exposure you have on authoritative domains, the more often your site will get crawled. Google is a monster, and I’ve had brand new sites indexed within hours simply from creating accounts and making some submissions. It works, so when you build a new domain, throw some content up on it and start creating accounts and doing submissions of your content pages as soon as possible. In my opinion, the promotional benefits of Social Media are very similar to E-mail campaigns, and if you want to get really on top of things you should use Video as a promotional tool. As a recent example, think of the Social Success of the Old Spice advertising. Brilliant, I really doubt it cost much money to do, and the campaign took off like wildfire reaching an epic number of people. Anyway, this is very similar to running an e-mail marketing campaign; social network infrastructure allows you to very easily launch and measure promotional deals across hundreds of Web pages. With a single email you can roll out promotions, contests, events, etc. to thousands of your readers and listeners. As long as they’re timely, relevant, and worthwhile people pay attention and share them. If you want to get really on top of things you should use Video as a promotional tool. Video is AWESOME, and in my opinion still completely underrated as a promotional tool in the small and medium business world. As a recent example of social success using video, think of Old Spice on YouTube. Granted they’re a big brand with a big budget, but the method is simple and brilliant. And relatively, I really doubt it cost much money to do after the first commercial. The campaign took off like wildfire reaching an epic number of people. This isn’t a cop-out, but seriously, just a little encouragement. Make up new ideas. Try them out. Have fun with it. If someone else is seeing enormous success, think of ways you can expand on their ideas. It’s how we innovate and move forward; and at any moment, the public is waiting for something new to come along that answers the new situations we find ourselves in. As a marketer, don’t spend too much time trying to polish a turd if you have lots of ideas; when you throw enough at the wall, if you’re paying attention to your metrics, you’ll know what sticks. Social sites practically encourage you to expand and build this stuff. You don’t even have to be on their sites to send them this data, it can be entirely automated through their APIs and connection methods. Line your sites up through a free Google Analytics account (note again, this is all FREE), you not only have a means to promote and build links but also the metrics to gauge the success of your efforts. Why would all of these massive, traffic-generating Websites want all this to be so easy; for you to connect your data to sites which are also competing for your attention? It’s simple. Because in the world of “free”, every one of these sites is in a constant struggle for relevancy. Do you think Facebook cares if you use Twitter? No, unless you’re not using Facebook. Start with the Big Guys – The biggest sites first. Twitter and Facebook, and follow suit. If you’re into Mobile, get started there by loading your businesses into FourSquare & Yelp. Free Is Good – One thing I’ve found is most software and online services usually have free competition, or free tools that do similar things. 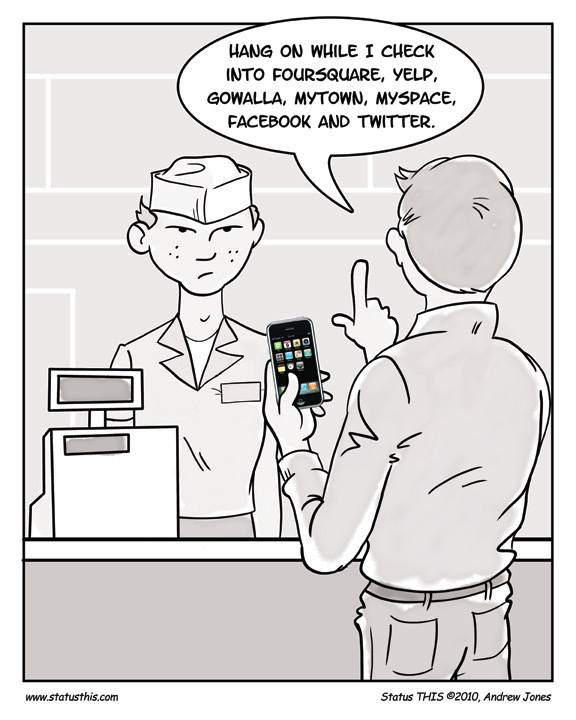 So shop around before you decide on purchasing anything from the so-called “social media experts”. If it’s free, try it out, if nobody’s using it (yet), move on. It’s easy to say “wow, that’s interesting” when you install a new application, only to discover it has the practical use of the Ice Cream Maker in your kitchen cabinet. In marketing, there are bigger fish to fry. Understand The Value – Start with the tips above, and experiment to see if you can find new ways to market & sell your products. My tips are evergreen and marketing, say, urinary catheters, is going to be far different from selling an Apple iPhone game, which could actually see some real success with Facebook Marketing.